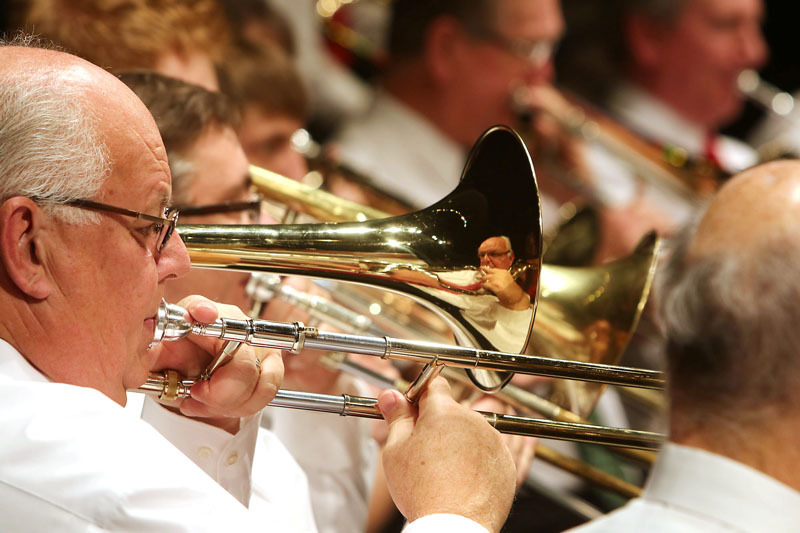 The Blair Area Community Band celebrated its 20th Anniversary at the Holiday concert on Sunday, December 14. 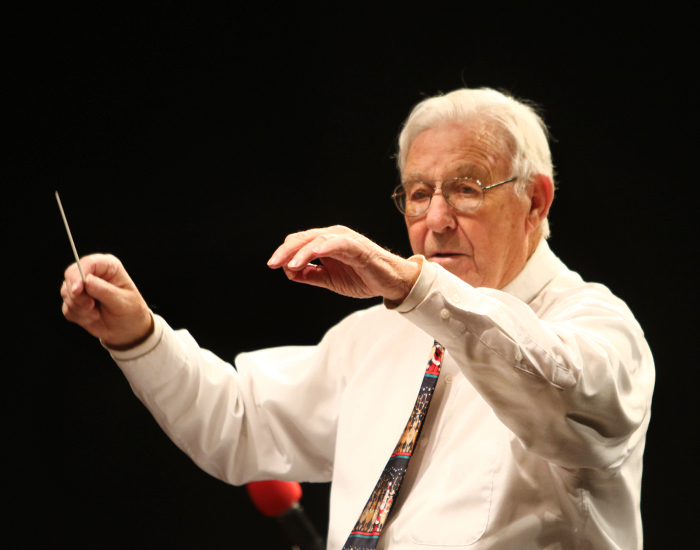 To commemorate the occasion, the band commissioned a musical score by Nebraska composer and teacher Nolan E. Schmit. Schmit was in the audience to listen to the world premier of “Flatwater Sketches” which he wrote for the band. 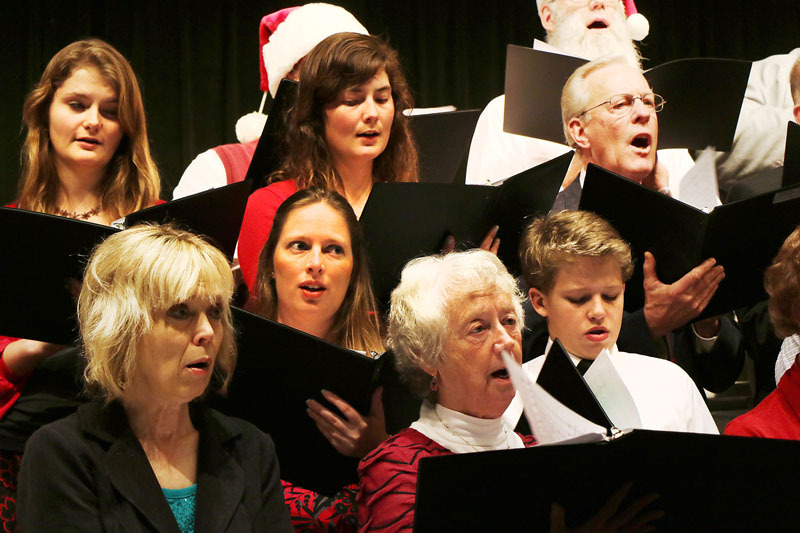 The Sunday concert began with vocal holiday selections by the Blair Community Chorus. 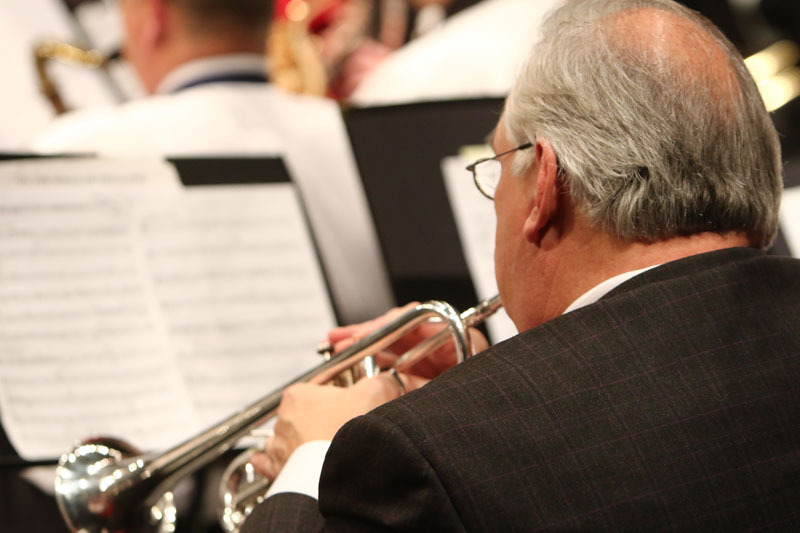 Band members include high school and college age students to retired physicians, accountants and educators. No matter the age or occupation the all share a love of performing music. 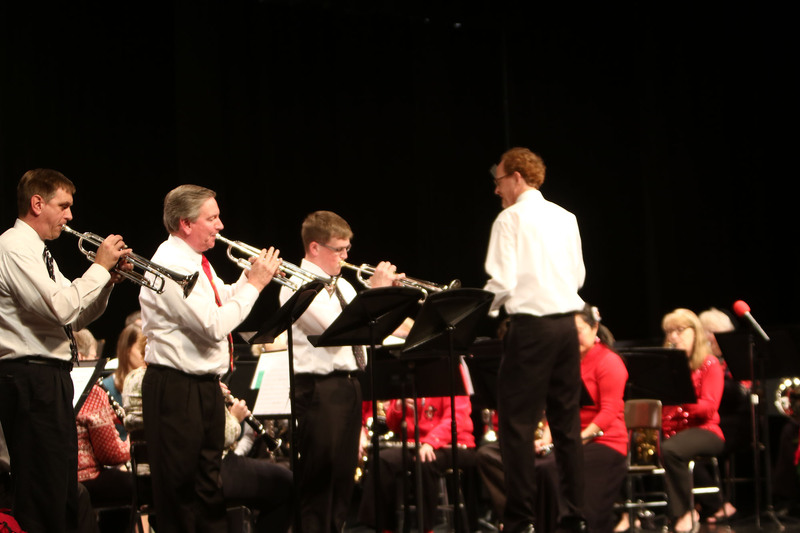 Trumpet trio Dwight Rose, Kirk Conyers and Ryan Beasley play Bugler’s Holiday during the 20th Anniversary Blair Area Community Sunday in the Blair High School Auditorium. 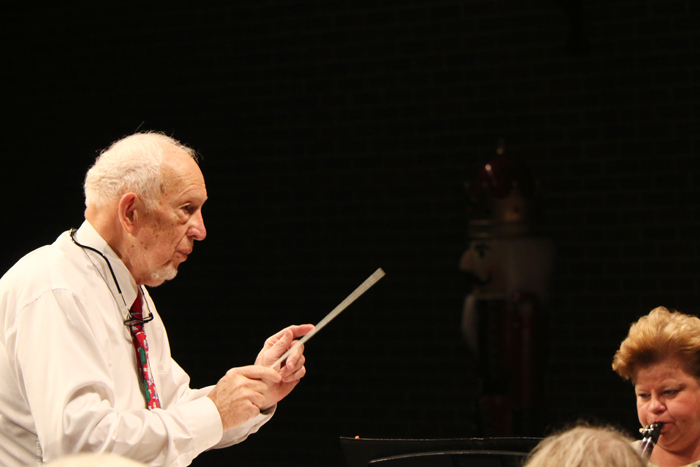 Guest conductor Joe Chapman directs the band in a Santa Song Medley. Chapman organized the Blair Area Community Band in 1994. Trumpet player Brian Smith was also a guest conductor. Smith is Warning Coordination Meteorologist at the NOAA office in Valley, NE. 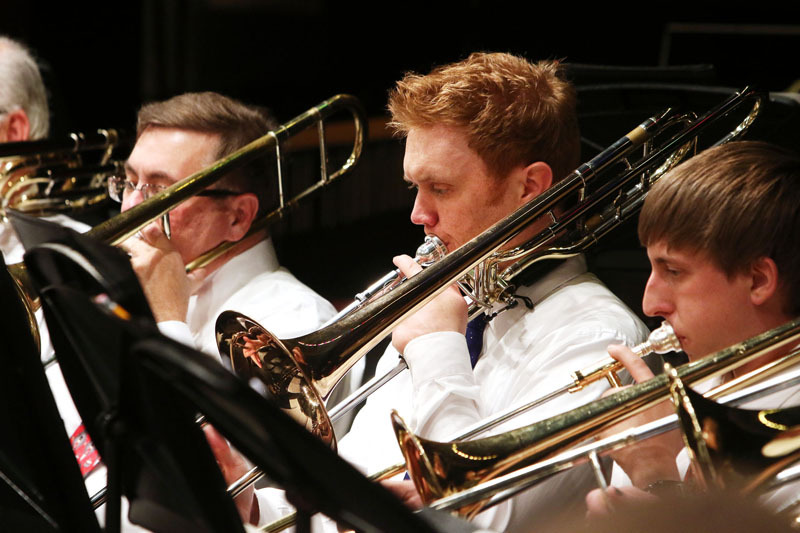 Trombone players Ron Welton, Lars Madsen and Jason Oerman. Welton is a sales person, Madsen is in banking, and Oerman is a diesel mechanic. Guest conductor Dr. Charles Bagby directs the band playing John Philip Sousa’s Stars and Stripes Forever. Dr. Bagby was a Family Practice Physician at the Blair Clinic until his retirement in 2005. He is a founding member of the Blair Community Band. Prior to the band concert, The Blair Community Chorus under the direction of Molly Willing performed a concert of holiday selections. 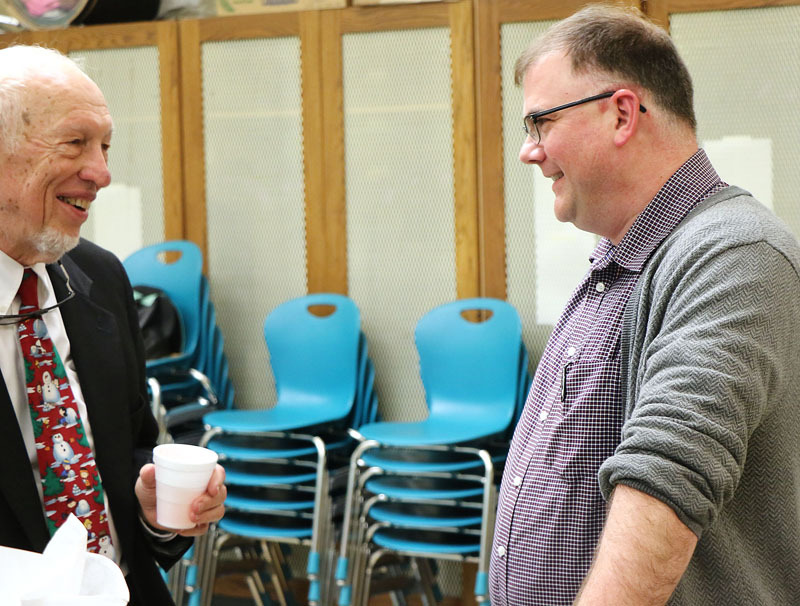 Founding Blair Area Community Band member Dr. Charles Bagby talks with music composer Nolan E. Schmit following the concert. The musical selection Flatwater Sketches was commissioned by the Blair Area Community Band to commemorate the band’s 20th anniversary. Craig Shogren sings with the Blair Community Chorus. Trumpet player Paul Johnson is a financial planner. Bass clarinet player Chase Crispin is a student at Blair High School and plans to be a music teacher. Saxophone player and community band founder Joe Champman takes a bow. Trumpet players Kirk Conyers, Dwight Rose, Ryan Beasley and Paul Johnson. String base player Delores Dorland is a teacher.